Many things about The W’s new low-residency MFA in creative writing get me excited, especially communicating with prospective students, but lately the most exciting part has been putting together a fall schedule. That is still very much in flux and will depend on the needs and desires of the students who actually apply — as I’ve told our faculty, I have to have students for a class to make, and if we attract enough students, we’ll add classes to meet their needs. We have faculty lined up to teach fiction, poetry, and drama, so I’m excited to start teaching a new course in Writing for New Media. This is a course that I proposed for the program because it seemed like it would fit a need. It will be cross-genre and will explore the way genres are adapting or can adapt in a new, electronic mode of production. I want to look at everything from e-books to hypertext and social media tools like Twitter, Instagram, YouTube, etc. I want to explore how form changes or might adapt to the different media, and I want to look at how still photos and video can be used by authors, including short narrative films, poetry videos, book promo animations, and you name it: whatever writers are doing on the web might be part of this class! The excitement I have is tempered just a little by the name I chose for the course, which is a bit of a compromise. I wish there were a better term for it than “New Media,” in other words. Some of what we discuss isn’t new at all (I might bring in some late-medieval emblems and talk about the use of image and poetry, for instance). And some of what we discuss will be obsolete within a few years (who knows how long Facebook or Instagram will last, for instance). Something newer will come along and everything will change or shift slightly. That’s one reason I do like the name, of course. Rather than naming what new media will entail, I leave it open to explore. But I do realize that it can lead to some confusion. I’ve had more than one person (prospective student or prospective faculty) ask what the class is about, and as I tell them, they usually get excited, too. That’s in part because the course is meant to be one that encourages students to rethink genre and rethink how they will get their words out into the world. A genre-bending class can be very useful in any MFA. But the other part of the class that is exciting to me is that I want it to be as much about how writers make a name for themselves, how we “brand” ourselves, as it is about creating “great literature.” As I think about it, I’d like to include practical discussions of the marketplace in any graduate workshop, regardless of genre. But in Writing for New Media, I want to look at all writing on the same level, whether it is a poetry video or a book review blog or a book or reading promo animation. All can be creative means of expression, and all can lead to opportunities to publish. Some will be paid or will lead to paying gigs. A book promo could lead to other advertising jobs, maybe for non-profits or hip local companies. I wanted to offer Writing for New Media this fall for a couple of reasons. One is that I want to figure out exactly what it will entail by teaching it once (even though I expect it to be the kind of class that never remains static but always evolves). Another reason to offer it is that I think it can be an exciting class for all of our students, regardless of their primary genre (if they have one). I’ve begun collecting resources on different kinds of media that are out there, and I’ll ask students to take an active role in finding the kinds of new media they are interested in. I especially like a class where the students teach me as much as I teach them (isn’t that always the goal), and I’m willing to make this class a very open format in that regard. It should be a great way to start our new program, and if all or most of our students end up taking the class, it will provide a good common experience for the inaugural class as well. A few months ago, I wrote a post about my dad’s 1946 Motorette motor scooter. I’ll admit, we had talked about trying to sell it, and I did have that on my mind. I had promised my mom I would look into it, yet in a couple of years, I hadn’t done much. It’s the kind of odd item for which you need to find just the right buyer, and we weren’t hooked into the right community to do that. So, I thought I’d write a blog post and see what happened, never expecting much, but hoping I might generate some interest and maybe a lead. Little did I know how fruitful that post would be. A few days after I posted it on this blog, Larry Fisher wrote a comment, and I replied, telling him we’d be interested in selling. A few emails later, we reached an agreement. Larry collects and restores autoettes, the class of vehicle the Motorette is in. He’d even tried to purchase one a few years back. And it turned out that Larry’s wife and my mother share the same name, and they had even been in Osage, my home town, a few years back on a trip down Highway 9. They remembered stopping at Stan’s Drive-In. It seemed too good to be true. I will say that we weren’t looking for a lot of money from this sale. We asked him to name a price, and we offered to help some with shipping. Our main goal was to find the Motorette a good home, where it might be restored to running condition (we had no idea how much work this would be — as it turns out not that much, since it’s been running already this summer, but still much more than I could imagine doing myself). The Motorette had been stored in my parents’ garden shed for over twenty years, and was in decent shape, though it needs some care to really restore it. Field mice had nested under the seat and eaten through some of the wiring. Larry flushed and lubricated the engine, transmission, and bearings and rewired the electrical system to bring the scooter back to life. Though we were glad to get a little money out of the deal, and glad to know that the Motorette was still valuable, the best part of the deal has been getting to know Larry and finding out more about the scooter. My mom found a newspaper clipping that talked about how my dad bought the Motorette and had it delivered by my (soon-to be) uncle Frank Mulvihille. Frank was a pilot, and his airline flew the Motorette from Chicago to Des Moines for free. It made the news, since my Dad was a WWII veteran who suffered from polio, and that kind of public interest story was popular in the months after the war. Larry even did some research and found some newspaper archives with other references to my dad’s military service. We found multiple license plates and old registration papers. This allowed my mom to renew the registration and then transfer the title to Larry, making the whole process much simpler. I now have a license plate and photos from 1976 when I rode the Motorette in the Bicentennial Fourth of July Parade in Osage, one of the last times we got it running. 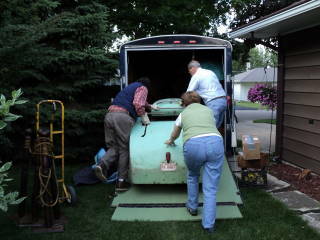 The only hassle was with shipping the Motorette across the country to its new home. There were many delays and we were nearly afraid it wouldn’t happen, but finally in late May, the shipping company came through, and the Motorette was on its way to its new home. Since then, we’ve maintained contact with Larry, who has sent some video of the first time the Motorette was running, the engine, and a visit with my brother Kermit and his wife Kim when he was in Boston for a gathering and showed the Motorette for the first time. 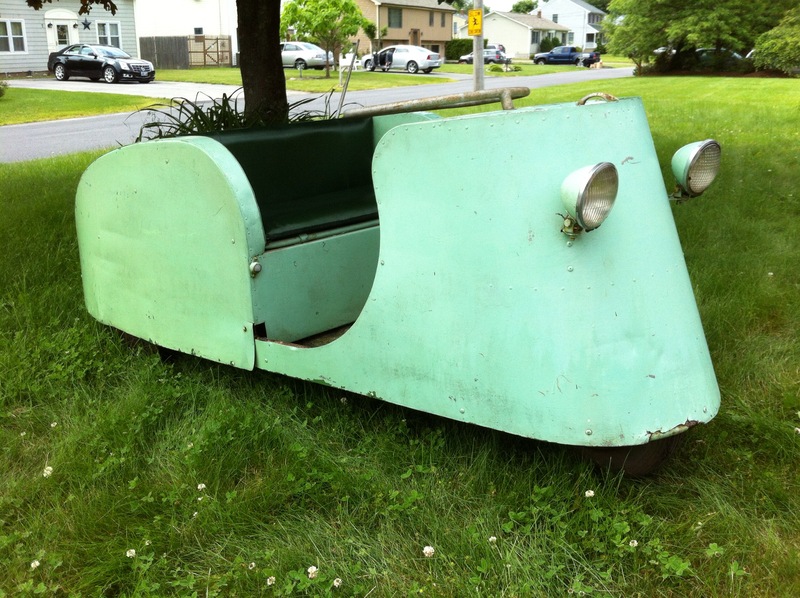 It sounds like Larry has plans to continue restoring it to get it closer to its original state (with the modifications my Dad made for using hand controls). We’re glad that Larry is so interested in the history of the vehicle and so willing to share what he learns. Maybe one day we’ll all get a chance to meet him and thank him in person. We’re glad Dad’s Motorette has a new life in a new home, and we’re thrilled to have made friends with Larry and Leone, all through a simple blog post. I’m constantly being asked this question, since the creative writing program I teach in has a class in it (that I don’t teach, but I’m the program director, so I get asked a lot anyway). It’s a tough one to answer, and usually I list some of the kinds of writing, I think might be in the class with the caveat that since I don’t teach it, the person who does might have other ideas. But today we were covering creative nonfiction in my creative writing class as we start to think about genre, so I tried to be a little more specific with the help of our textbook. We discussed why some people don’t like the term. It makes fiction seem like the norm and anything else is an aberration. Is poetry nonfiction? By this definition, it is. One writer I was reading in preparation for class wondered whether there should be a genre called non-poetry (and I have to believe she said this somewhat tongue-in-cheek). And why not? Isn’t all prose nonpoetry: somewhat poetic, but not entirely? The textbook I use (Janet Burroway’s Imaginative Writing) talks of creative nonfiction primarily in terms of the essay that uses some techniques of fiction (and poetry). [My beef with this book is that it doesn’t really do justice to poetry, but I try to compensate.] And nonfiction does or can use strategies from the essay, though it doesn’t have to. It can use strategies, like scene and even character, from fiction, but it doesn’t have to, and it certainly doesn’t use them the same way fiction does, usually. Plot is often less important in nonfiction. The dramatic tension of a scene doesn’t have to be as high or might not even be present. A scene in nonfiction can simply take us to a moment or a place without any drama or change — in a story I would expect that of a scene. But in a poem, we often have scenic treatment of the material (imagism, for instance) without a plot or dramatic tension. In a poem we might speak of lyric tension. The arrangement of images in a poem or the arrangement of scenes in creative nonfiction often work in similar ways. Juxtaposition is part of the argument. Associations formed between scenes or images that aren’t connected by plot or linear logic work in a poem or in an essay. The poet or nonfiction writer may comment or may not. Associations based on the sound of the language or on the connotations of the words may be as productive as associations strung together on a plot. As we discussed sub-genres of creative nonfiction, one of my students raised the question of whether blogging would fit. I agreed that often it would, though some blogs may be fiction or poetry, and some blogs might not rise to the level (sink to the level?) that would be called creative. Blogging may be the most ubiquitous form of creative nonfiction: the personal not-quite-essay, not-quite-story, not-quite-lyric-prose-poem. Maybe one day we’ll have to call all other writing nonblogging once blogging becomes the norm and everything else an aberration.